The Ecolodge has closed its first full season. We finally managed to gather and compose some data on the consumption of the Ecolodge. While designing our closed loop systems we had to make a lot of assumptions that where uncertain how they would play out. They played out beautifully have a look for your self on the pictos below. 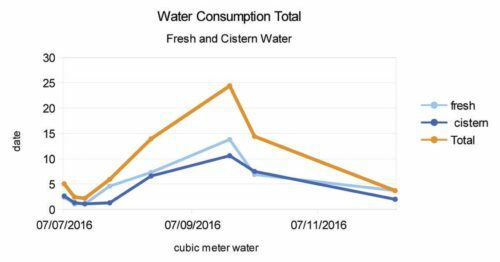 I believe we can state that the Ecolodge has one of the lowest consumption of fresh water in the tourist industry of Greece. This is mainly achieved by the utilization of rainwater for the toilet flush and the reuse of the filtered water for irrigation. The environmental benefit lays greatly in the reduced consumption of fresh water through out the year but especially in the summer period where the aquifers are under great stress. This often leads to sea water pressing into the fresh water bodies making the water brackish and reducing the quality to the point where it is not suitable for human consumption anymore. While we reduce our fresh water consumption, we still gain water for our ornamental plants. So we can support a quite dense plant cover which affects the micro climate positive. When we take a look at the average numbers that are given for the Greek Tourist Industry where daily fresh water consumption per person lays around 400L the Ecolodge managed to lower this by around a 4th to approximately 100-120L. These number is impressive because even compared to a highly developed country like Germany consumption lays at 200L. The first Graph shows our total water consumption and the distribution between fresh water and rain water supplied by the cistern. 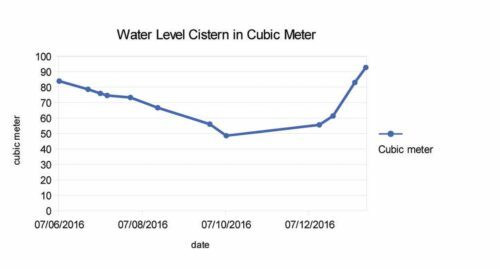 The Graph shows clearly the increasing water demand towards August. This is explained by the full utilization of the client hosting capacity of the Ecolodge and the increase in irrigation demand caused by high temperature and increased wind. 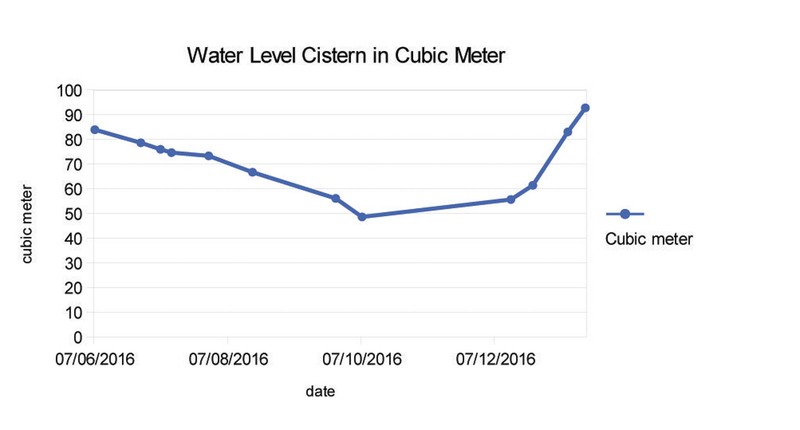 The next Graph shows the stress put on the cistern during this period. While the demand increases there is no inflow during the 4-5 summer months. All of our electricity needs are covered by the photovoltaic system successfully. The amount of electricity produced saved around 3 tons of CO2 (carbon dioxide) which equals out to the amount that 15 trees would accumulate over a life span of 45 years. In other words it equals to 3 round trips by airplane from Berlin to Athens to Berlin. Hmm that sounds like we still have a long way to go in order to make a substantial change for our planet. Thats true but we are becoming better…. Throughout the winter we planted around 17 new trees. That hopefully will support our efforts with nice local Lemons, Nectarines, Almonds, Mirabel, Apricots and Olives. We also planted around 70 ornamental plants and herbs like Lavender, Rosemary, Oregano, Sage, Caper and some climbers like Bougainvillea, Wine and Jasmine. Most of these plants we support with Compost that is produced by our guests from kitchen waste and the Aquatron Unit that produces humanure. The Vegetable garden is getting bigger and bigger from season to season and the output becomes more satisfying as we gain experience. The goal is to produce throughout the warm season more or less enough vegetables for our guests. These are 100% produced under organic ethics and are just delicious, while the need of imported vegetables is reduced.